2. Butter a 10 inch pie plate, and sprinkle 1 tablespoon of sugar over the bottom. 3. In a small sauce pan over medium heat, cook rhubarb with 2 Tbsp of sugar until rhubarb becomes soft. 4. 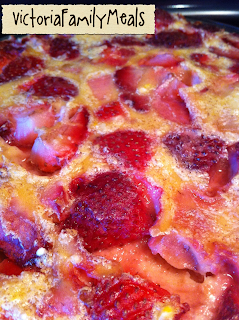 In bowl mix cooked rhubarb with strawberries and pour into a pie plate, spreading evenly in the bottom. 5. Using a hand mixer combine remaining sugar, eggs, soy, flour, salt and cinnamon. 6. Pour soy custard over fruit. 7. Bake for 50 to 60 minutes or until firm and lightly browned. Let stand 5 minutes before slicing. Without cherries, this is a flaunarde, not a clafoutis. Thank you for your comment, I was first introduced to calling this type of dessert as a Clafouti using halved plums and have found many recipes using different fruits. I am not a culinary expert, just a mom. I am also aware that a more tradional recipes use milk and not an alternative and often contain almonds. However, 2 cups of pitted halved cherries whould be excellent too. To keep this truely Dairy Free use Vegan Margarine.